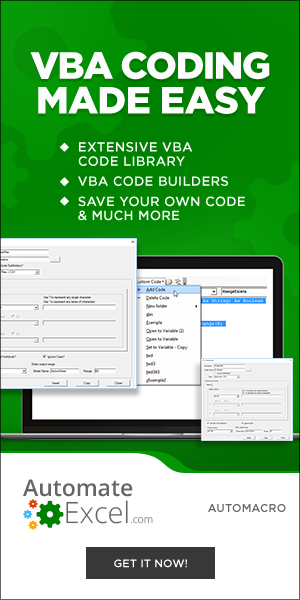 VBA allows you to use comparison operators to compare values. 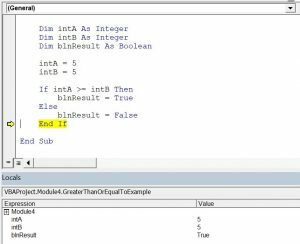 By using these operators, you can compare values and return a Boolean True or False as a result. In this example, we want to check if intA is equal to intB. 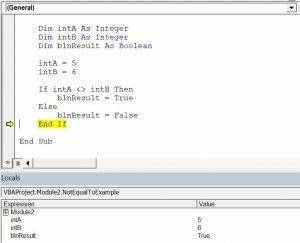 If this is true, the value of Boolean blnResult will be True, otherwise, it will be False. In this example, we want to check if intA is not equal to intB. If this is true, the value of Boolean blnResult will be True, otherwise, it will be False. In this example, we want to check if intA is greater than intB. If this is true, the value of Boolean blnResult will be True, otherwise, it will be False. In this example, we want to check if intA is greater than or equal to intB. If this is true, the value of Boolean blnResult will be True, otherwise, it will be False. In this example, we want to check if intA is less than intB. If this is true, the value of Boolean blnResult will be True, otherwise, it will be False. In this example, we want to check if intA is less than or equal to intB. If this is true, the value of Boolean blnResult will be True, otherwise, it will be False.